Burnet root (Diyu)- Sanguisorba officinalis L.
Common Name: Sanguisorba root, Burnet root. Part Used & Method for Pharmaceutical Preparations: The roots are dug in spring or autumn. After the fibrous roots have been removed, the roots are then cleaned, dried in the sun and cut into slices. 1. Hemorrhages due to extravasation of blood by heat: a) uterine bleedingBurnet root (Diyu) is used with fried Cattail pollen (Puhuang), Scutellaria root (Huangqin) and Fresh rehmannia root (Shengdihuang); b) hemorrhages, bleeding and dysenteryBurnet root (Diyu) is used with Sophora flower (Huaihua), Coptis root (Huanglian) and Costus root (Muxiang). 2. Burns, eczema, ulcers of the skin. 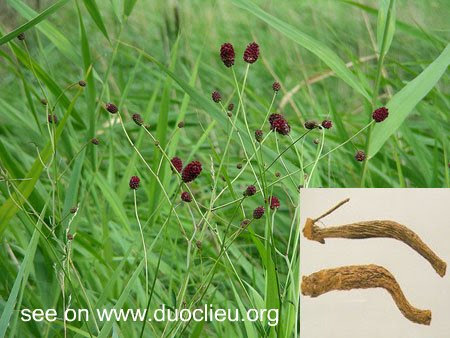 Burnet root (Diyu) is used with Coptis root (Huanglian) for external use. Cautions & Contraindications: This herb is contraindicated for large burns. The ointment made from the herb may cause a toxic infection after absorption by the body.